After about 2 years of languishing in my radio shop, the 440 repeater was finally finished. Here is a picture of the cabinet, containing the power supply, Micor backplane, controller, remote bases and UHF PA. 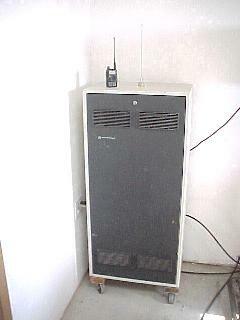 The 220 rig will always sit on one channel, 224.580 MHZ, the KH6JTM repeater here in Albuquerque. The KH6JTM repeater also has a dual-band VHF/UHF remote base, so by listening to this one 220 frequency I can monitor traffic on either 2M or 440, depending on how that repeater is configured. The VHF MT1000 has 16 channels with scan, which are selectable via touch tone. It puts out about 1.5 watts, which is boosted by a 10dB amp (15W out). 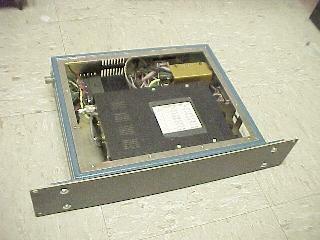 There is also a DB-9 on the back of the shelf to connect to a RIB, to allow MT1000 channel programming. The heart of it all is the control shelf containing two controllers, a Micro Computer Concepts RC100 and an NHRC-4. 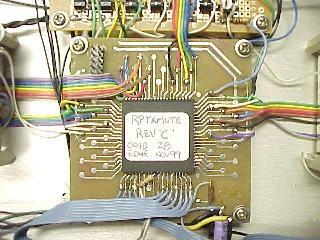 By using two separate controllers it was easier to interface two remote bases to the repeater. The RC100 controller has a feature called "hex outputs" which allow the user to set a 4-bit port on the controller using touch-tones. This interfaces perfectly to the channel control of my MT1000, allowing me to remotely select individual channels. Other discrete control bits turn the scan on and off. 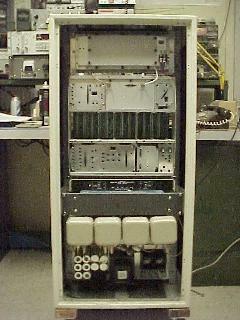 The 220 transceiver is hooked up to the NHRC-4. Since it's just a crystal rig it does not need a fancy controller to operate. 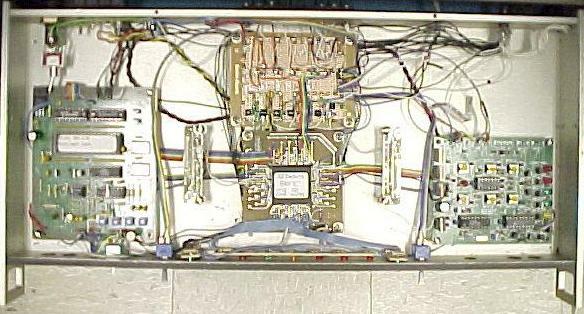 This is an Altera 7128S PLD, which contains all the logic to perform various cross-mute and buffer/invert functions. Most logic signals ultimately go through this device, which allows for future changes or additions. Being able to add, subtract and change logic gates and connections just by uploading a new configuration to the chip is almost too good to believe. It is able to drive the front panel LED's directly, which allowed convenient status indication of just about any signal point. After a couple of weeks on the air, the band-aided PA I built stopped working, and I had run out of parts for these old PA's. Rather than spend hundreds of dollars for a commerical replacement I experimented with using a UHF PA from a mobile radio. I have a stack of donor Syntor X's to pick from, so I picked a 100W one and sawed the PA away from the rest of the radio with a hacksaw. I mounted it to a 19" rack panel, orienting the cables in the same fashion as the stock Micor PA. I mounted a terminal strip for power, and three 12VDC fans to the rack panel as well. A simple thermostat switch controls the fans. Curiously the Micor power control board seems to handle keying duties for this PA just as well as the stock PA, hopefully this setup will last a lot longer. It survived a 24-hour keydown test at 125% of continuous power rating, but then again so did the one that puked. 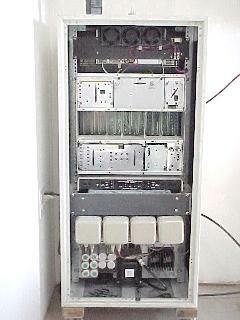 The 440 repeater is now on the air and working as expected. The control scheme using two controllers has worked out so well that I plan on doing the same system for the new 147.320 repeater. The system is already sounding like a pinball machine, when the new 2M repeater is done there will be 4 controllers beeping in response to 2 repeaters, a link, 4 remote bases, plus whatever other system(s) are linked to it. Maybe I've gone too far but so what, it's been a lot of fun and a great learning experience. Anyone can buy fancy voice-controllers and commercial repeaters, but this goes to show what can be built from junk and a bit of time and thought. 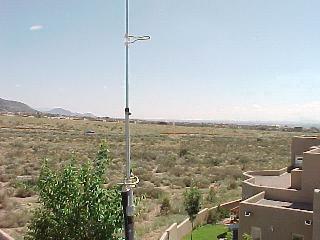 Here are some views from the K7YAM Official Repeater Site. Here is the box, rolled into it's corner. 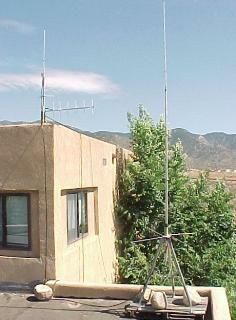 and 2M remote base antennas.